If you have a U.S. bank account, you can conveniently transfer funds to a recipient's bank account at Bangkok Bank in Thailand via the internet by completing the steps described below for an international ACH transaction (IAT). International ACH payments are processed in accordance with operating rules and formats developed by the Electronic Payments Association (NACHA). As long as you have a Bangkok Bank account you will not have a problem with using Transferwise. My bank statement transfers are shown as International Transfer. If anyone has not got a Bangkok Bank account I would suggest opening one asap. Having enjoyed 13 years in the Kingdom it’s time to move on to pastures green , every years seems to get more difficult when applying for extension of stay. Same same, but I am going to stick around a bit longer. It might well be obligatory medical insurance, or obligatory medical treatment that drives me to those green pastures... or back to misery land! I bank with Bangkok Bank. MY UK government is transferred by the government and appears as a BAHTNET transfer. Transferwise payments are listed as "international transfer"
Thanks for providing this. I think that this is pretty clear. For those of us who have used Transferwise for some time will be aware that their service has become quicker over time and is often next day. Clearly their current business model doesn't give any concern as to how the payment is recorded in individual Thai bank accounts. As others have pointed out it's hit and miss as to how it is shown in your account as it might on occasions come from another Thai bank account. I think that, from the middle of 2019 we may well have to revert to the 'old fashioned', slower and costlier SWIFT transfer to get the 65k over each month and use Transferwise only for extras. A pain but there it is. As an aside I wonder if a letter from my wife stating that she would throw me out if I only brought over 65k a month would satisfy immigration! I smile wistfully at the posts suggesting that the poster is wondering how they can possibly spend 65k a month. May I direct them to my wife for advice? And as I had pointed out to me SOME regional offices do not accept this, Udon Thani was cited. Where is your Extension done? Phuket. I have used my FCD account to renew my extension for the last 2 years. TransferWise has the ability to print a PDF showing all your transfers. The PDF shows the amount, time and date of the transfer and the Bank and account number the funds are transfered to. I would think this is sufficient backup evidence. Oh you think? That's not the issue. The question is, will it be accepted by immigration? Right now they only accept a letter from a local Thai bank with the company seal stamped on the letter with a signature of a bank official. So good luck with Transferwise PDF. Here's how it will go. On presentation of your PDF you will hear the IO say, cannot accept. Come back with letter from Bank. Next please. TransferWise do not transfer money internationally, they have local accounts and pay it locally. So therefore Immigration won't accept the UK gov payment as income from abroad, same prob I have with Kasikorn. I have spoken to OFX there rates are nearly as good as TransferWise and the Customer Service appears good, they send the money by the Barclays routing system which use Bangkok bank (never mind) as their intermediary bank, I was just about close my account with Bangkok Bank but now might keep it open as use it for evidence of my transactions using OFX, I've yet to test the system. I cant see the Banks standing loosing accounts without bringing the prob to the attention of the powers that be. Thanks. I have used OFX (as UKforex) for some time before I discovered Transferwise and I still have an account with them. I will consider that option. 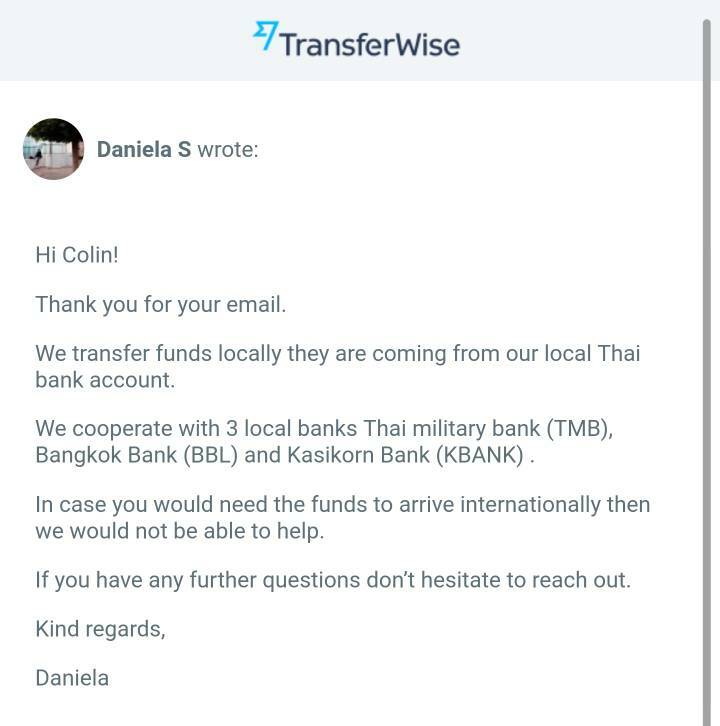 Has anyone received funds into a Bangkok Bank account from Transferwise that were NOT shown as an Intl receipt..? I've seen many reports (plus my own experience) that other banks are hit & miss, regardless of which intermediary bank gets used, but I've only ever seen reports that BBL is always a hit. Perhaps time to (try to) open a BBL account..? You need to establish how the payment is sent, its probably sent by a banking system like Barclays, Barclays use Bangkok bank as the intermediary bank, so I suspect that if you had an account with them it would show as an international transfer.